The New York Naval Shipyard, popularly and unofficially known as the Brooklyn Navy Yard, was at different times in its history also officially designated as the New York Navy Yard and United States Navy Yard, New York. The former New York Naval Shipyard is located 1.7 miles northeast of the Battery on the Brooklyn side of the East River in Wallabout Basin. There are three piers: G. J. and K. These piers are owned by the City of New York and operated by Seatrain Shipbuilding and Coastal Drydock and Repair Corporation as mooring piers for outfitting and repair. There are a total of 10 berths 350-890 ft long, with 10 ft deck height and 25-40 ft depth alongside at MLW. The channel is dredged to 40 ft up to the shipyard, but the current in the East River is strong and congestion is heavy; caution should be exercised in navigating this river. Access to the piers requires passage under the Manhattan Bridge (suspension open with a clearance of 134 ft) and the Brooklyn Bridge (suspension span with a clearance of 127 ft). The Navy Yard skirts Wallabout Bay, a semicircular elbow of the East River. The East River is 14-mile long tidal straight that connects Long Island Sound with New York Upper Bay and seperates the western end of Long Island from the New York mainland. A Federal project provides for main-channel depths of 35 feet from Throgs Neck to the inactive New York Naval Shipyard, about two miles from the western entrance, and thence 40 feet to deep water in New York Upper Bay. 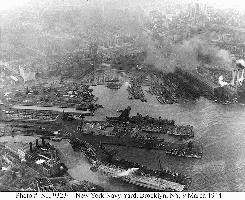 The Navy Yard was established by the federal government in 1801. It was the site for the construction of Robert Fulton's steam frigate, the Fulton, launched in 1815, as well as of other historic vessels. During the Civil War, the Yard expanded its operations and its employees numbered about 6,000. In 1890, the Yard's ways delivered to the sea the ill-fated Maine, and continued in operation through the first World War. In the 1900s the yard, known by its workers and neighbors as the "Brooklyn Navy Yard", drew from the vast population pool of the New York metropolitan area. The activities of the yard in 1938 required the services of about ten thousand men, of whom one-third were WPA workers. On the eve of the Second World War the yard was traversed by more than five miles of paved streets, and contains four drydocks ranging in length from 326 to 700 feet, two huge steel shipways, and six big pontoons and cylindrical floats for salvage work. In addition to the numerous foundries, machine shops, and warehouses it has barracks for marines, a power plant, a large radio station, and a railroad spur. In 1937 the 35,000-ton battleship North Carolina (BB-55) was laid down. More than 728 feet long and had a maximum speed of 27 knots, it was the first of the modern class of American battleships built just before World War II, where high speed was combined with powerful armament. The yard became the leader in battleship construction. The ship Iowa was completed at the New York Navy Yard in 1942. The Iowa was considered at the time to be the world's most powerful ship. 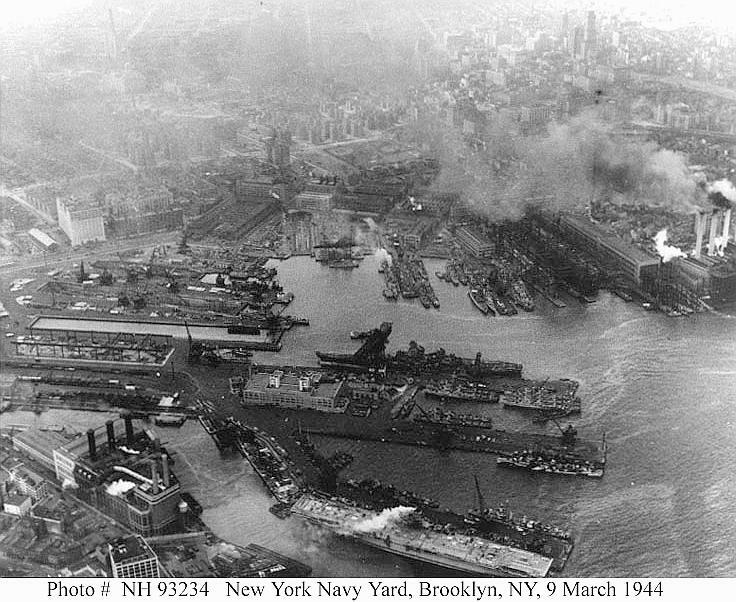 The Navy yard's activity peaked around October of 1944, at this point employing over 71,000 workers, while earnings surpassed $4.2 million weekly. The shipyard worked through the night, maintaining activity a full 24 hours a day. With an enormous supply department, it moved more than 22,000 tons of supplies daily and stocked more than 75,000 items. During World War II, women were hired for the first time at the yard serving as mechanics and helpers. After the war, the yard's demand and work force scaled down. Nonetheless, activity continued throughout the Cold War with the attention shifted towards aircraft carriers. On 12 January 1953 test operations begin on USS Antietam (CVA 36) which emerged in December 1952 from the New York Naval Shipyard as America's first angled-deck aircraft carrier. The Navy Yard was decommissioned in 1966. Within a decade, it had become an area of private manufacturing and commercial activity. Currently the Brooklyn Navy Yard Development Corporation manages and operates the Brooklyn Navy Yard for the City of New York. The Navy Yard, the City's premier industrial park, has over 200 tenants with more than 3,500 employees. GMD Shipyard is located within the world-renowned Brooklyn Navy Yard and is the largest dry dock facility in New York City. GMD offers two 1090' x 150' graving docks, in addition to 1100' of wet berth, and provides 24-hour full service operational capabilities. Our dockyard maintains and operates numerous cranes ranging from 15 tons mobile to 200 tons gantry. The facility is outfitted with all the equipment and services necessary to produce and perform any type of maintenance or repair, including grit blasting, ultra high-pressure water blasting, painting and steel fabrication. With a dedicated team of skilled technicians and specialists, GMD Shipyard can respond to any task quickly and efficiently, whether it is routine maintenance or emergency dry-docking.